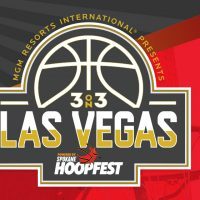 The Las Vegas 3-on-3 Basketball Tournament returned here for it’s annual “Best Basketball Weekend on Earth” by MGM Resorts International and Spokane Hoopfest Association. It was held at Las Vegas Festival Grounds October 27-28. John Balistere of MGM Resorts Basketball Operations, Spokane Hoopfest’s marketing director, Morgan Marum, and Rodney Haddix, the head coach of Findlay Prep discussed the event.